NEW YORK -- An online campaign was created in the wake of a lawyer's tirade against Spanish-speaking workers, with a single aim: sending a mariachi band to perform outside his Upper West Side home. 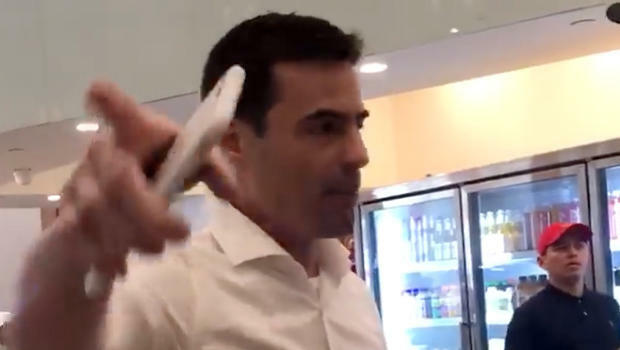 Attorney Aaron Schlossberg has come under fire for a video that shows him ranting against Spanish-speaking employees at Fresh Kitchen in midtown Manhattan on Tuesday. As the video shows, Schlossberg presumed the employees live in the U.S. illegally on welfare paid by his taxes. After he was identified, people shared previous footage of Schlossberg engaging in xenophobic hate speech. They also changed his law office's Google listing to a Spanish restaurant and drove his firm's Yelp rating down. If that wasn't enough, a "Mariachis For Aaron" campaign on GoFundMe raised $1,094 in two days -- more than double its goal -- to send a Mariachi band to his office for a "Latin Party" with demonstrators. "We are countering hate and racism with the sound of music," writes Mark Goldberg, creator of the GoFundMe account. "Any leftover money will be used to send a delicious Taco Truck lunch to the staff and a copy of all federal and state statute mentioning undocumented immigrants do not qualify for welfare." Schlossberg's actions haven't just led to being been berated; Schlossberg was also kicked out of his office space and received a complaint from elected officials, who sent a letter Thursday to the disciplinary committee for lawyers in the state of New York. Schlossberg could not be reached for comment.